Just like the castles in England and Scotland, the many castles of Ireland were among the results of the Norman Invasion in the 1100s. Before that, there had been no Irish castles, only “ráths,” or fortifications, which would not qualify as “castles” based on our modern understanding. As more and more royals, nobles, knights, and various other notables of the passing times staked their claim over one county or another, more and more castles also sprung up. Establishing motte-and-bailey castles over newly conquered territory allowed the Normans to control the area. Castle construction only began to evolve into the types familiar to us today during the end of the 12th century. Some of these survived for a time, only to succumb to the ravishing forces of the ages; others have been steadily maintained and improved upon. Some passed hands and families so many times; others still belong to the same bloodline that had had them built generations ago. There’s no denying the strong hold that these Irish castles have over us. If you pause and think about it, the incredible sense of history and legend that these buildings give off cannot but stagger you. Following are only a mere handful of the most famous Irish castles and brief explanations of why they are notable. Cahir Castle (County Tipperary) Said to be well-preserved, the structure is only slightly different from how it had been around 1142 when it was built. It was the former seat of the Butler family who had been part of the Irish nobility. Ashford Castle (County Galway) This is one of those castles that give off the feeling you’ve stepped into a childhood daydream. It is literally the stuff that our favorite fairytales are spun from. It has been converted into a 5 star hotel and boasts of 800 rooms. Blarney Castle (County Cork) Considered by many as the most handsome-looking castle, it dates from 1446 and houses the much “talked about” (pun intended) Blarney Stone, an item from legend that when kissed a certain manner, could give the person the “gift of gab.” Dunsany Castle (County Meath) Construction for this castle began at about 1180-81 and had been occupied since that time by pretty much the same family or bloodline. The castle available to us for viewing is about four times bigger than the original. 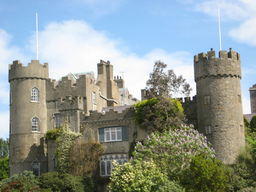 Malahide Castle (County Dublin) Up until 1975, this had been the oldest castle that had been inhabited by a single bloodline for the longest duration. The last of the direct descendants died in 2009, but not before giving up—due to financial constraints—the castle they have owned since 1185. Tullynally Castle (County Westmeath) The Pakenhams have grown their roots in this 120-room castle for 350 years. The castle itself is mostly restricted, but the beautiful gardens are always open for visitors. Emerald Island Casino may not be an Irish castle, but it’ll sure give you the vibe of being there! Especially with the Irish artwork by local artist Edwin Leishman. So come on down and check us out!